These brothy beans are inspired by a recipe that Food52 cofounder Merrill Stubbs makes—they’re a stripped-down, vegetarian take on hers. The shorter ingredient list is offset by a couple of slightly fussy steps, but that—along with really good dried beans—is what keeps this dish from being basic, boring beans. Serve them as is, or make them a meal by topping them with a poached egg and some greens—or a scoop of pesto. Place the beans in a large pot and add 8 cups water. Preheat the oven to 375 degrees F. Slice each head of garlic in half horizontally, and discard most of the papery outer covering (you want the heads to remain intact). Put the heads back together, set each one on a small piece of aluminum foil, and drizzle with olive oil. Wrap the aluminum foil up around each head to seal it into a packet. Bake until the garlic cloves are soft, about 40 minutes. Set aside to cool. Turn off the oven. The beans will have expanded after soaking, so make sure they’re still covered by the water, but not by very much. Add the onion halves, Parmesan rind, and thyme to the pot and bring to a boil over medium-high heat; keep at a boil for 10 minutes. Then partially cover the pot and reduce the heat to keep the beans at a gentle simmer—medium or medium-low heat, depending on your stovetop. If the water level drops below the beans, add hot water from a teakettle to just barely cover them again—don’t add too much! Add the garlic and onion puree to the pot of beans along with the salt and vinegar. Taste and adjust seasonings as necessary. 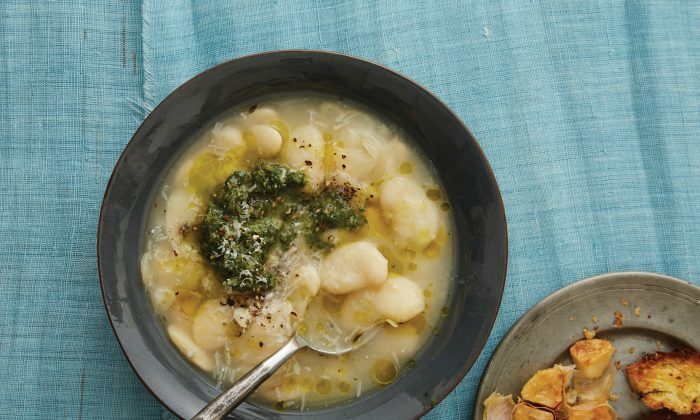 Ladle the beans into bowls and garnish each with black pepper, grated Parmesan, and a scoop of pesto, if desired. Serve with bread smeared with the remaining roasted garlic. Recipe reprinted with permission from “Cooking With Scraps” by Lindsay-Jean Hard. Published by Workman Publishing.